In the early eighteenth century, the Pirate Republic was home to some of the great pirate captains, including Blackbeard, "Black Sam" Bellamy, and Charles Vane. 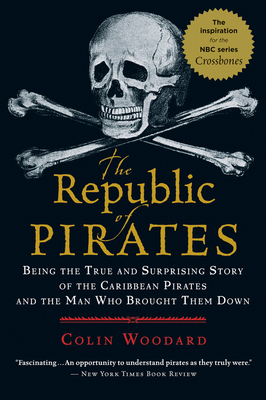 Along with their fellow pirates—former sailors, indentured servants, and runaway slaves—this "Flying Gang" established a crude but distinctive democracy in the Bahamas, carving out their own zone of freedom in which servants were free, blacks could be equal citizens, and leaders were chosen or deposed by a vote. They cut off trade routes, sacked slave ships, and severed Europe from its New World empires, and for a brief, glorious period the Republic was a success. COLIN WOODARD is the author of American Nations: A History of The Eleven Rival Regional Cultures of North America, The Lobster Coast: Rebels, Rusticators, and the Struggle for a Forgotten Frontier and Ocean’s End: Travels Through Endangered Seas. He is State & National Affairs Writer at the Portland Press Herald, where he won a George Polk Award for his investigative reporting. His writing has appeared in Smithsonian, The Economist, the Washington Post, and many other national and international publications. He lives in midcoast Maine. Visit www.republicofpirates.net.